General Atomics Electromagnetic Systems (GA-EMS) will be exhibiting their latest innovations in hosted payload satellite technologies at the 35th Space Symposium, April 8-11, in Colorado Springs, Colorado. 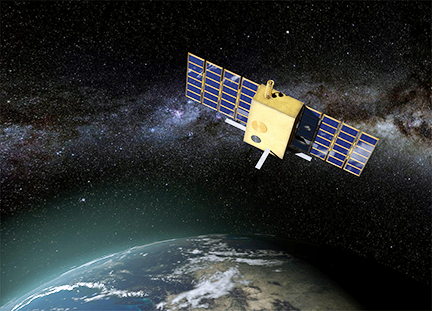 During the exhibition, GA-EMS will provide updates regarding recent contract awards and advancements in optimized hosted payload spacecraft to deliver multiple customer payloads meeting their requirement in LEO and beyond. GA-EMS is working with NASA to host the Multi-Angle Imager for Aerosols (MAIA) payload on an optimized OTB satellite and is under contract to the Air Force Space and Missile Systems Center Hosted Payload Solutions (HoPS) program for the Argos Advanced Data Collection System (A-DCS). GA-EMS is also part of the Draper team supporting NASA’s Commercial Lunar Payload Services (CLPS) program, which will return NASA to the moon. GA-EMS will be exhibiting in Booth #330, located in the Exhibit Center at the Broadmoor Hotel, site of the 35th Space Symposium. Scott Forney, the President of GA-EMS, said that since last year’s Space Symposium, the company has received contracts that will leverage the firm's scalable architectures, volume-efficient packaging, manufacturing expertise, and on-orbit experience to launch customer missions into space. Two of these contracts anticipate launch dates as early as 2021 and 2022, demonstrating the flexibility of the GA-EMS Orbital Test Bed (OTB) platform approach to rapidly and cost-efficiently accommodate specific customer payload and mission requirements. Nick Bucci, VP of Missile Defense and Space Systems at GA-EMS, noted that this is an exciting time for the company, as the firm anticipates the imminent launch of the first OTB spacecraft on the next Falcon Heavy, which will deliver multiple payloads, including the NASA Jet Propulsion Laboratory’s Deep Space Atomic Clock, to LEO. The company has generated a great deal of momentum this past year and firmly believe that the firm's customer-centric approach to providing flexible, scalable and optimized bus designs along with launch coordination and on-orbit mission control services, is critical to delivering payloads when and where customers need them as efficiently as possible.